This qualification gives people who are already working, or wanting to work, in the construction industry, essential knowledge regarding health and safety. Passing this qualification and the CITB test will allow you to apply for your CSCS card. 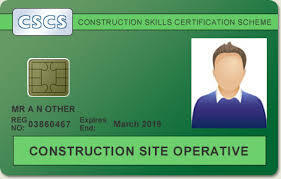 Having a valid CSCS card is a mandatory requirement of working in the construction industry. fatalities and ill-health in a construction environment. The content of this qualification will also prepare you for taking the CITB test and CSCS card application. Option 1 – attend a days training at our centre in Chesham and prepare yourself for the online assessment. At the end of the course take the online assessment in our examination room. Option 2 – learn and revise yourself by either buying an online revision course from us and when you happy that you know enough come to our centre at an agreed time to take the online assessment. Option 3 – Buy an online revision licence and make your own arrangements to take the online assessment at an approved centre where and when suits you.